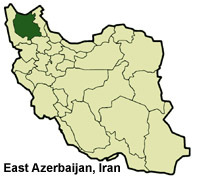 East Azerbaijan is one of the 30 provinces of Iran. It is in the northwest of the country, bordering Armenia and the Republic of Azerbaijan, and the provinces of Ardabil, West Azarbaijan, and Zanjan. Its capital is Tabriz. TEHRAN, Dec. 2 (Mehr News Agency) -- Five archaeological teams have been sent to East Azarbaijan to carry out rescue excavations at the reservoir of the Khoda-Afarin Dam. Many Bronze Age sites will be submerged by the dam after it becomes operational, Archaeological Research Center of Iran (ARCI) Director Mohammad-Hassan Fazeli Nashli told the Persian service of CHN on Tuesday. The rescue operation needs more teams due to the large expanse of the sites, he added. The teams are being led by Alireza Hojabri-Nobari, Ali Zarlaqi, Bahram Ajorlu, Mohammad Feiz-Khah, Bairam Aqalari. "Carbon-14 dating experiments will be carried out on the artifacts being unearthed in the sites and the results will be considered as a primary database of the Bronze Age in northwestern Iran," Fazeli Nashli said. "The dam has been completed one year ago and its filling was postponed following an ARCI's appeal for rescue excavations, which are being financed by the dam's officials," he added. "Some artifacts, which been have unearthed so far, are intact and they can be displayed in a site-specific museum if the dam's officials are willing to finance its construction," Fazeli Nashli noted.